India Post, Haryana Circle has invited applications for the 682 posts of Gramin Dak Sevaks. It is a golden opportunity for those candidates who have 10th pass. For the higher degree holders there is no any weightage in the selection process for the Postal Department GDS vacancy, so it is a suitable opportunity for the maitric pass candidates seeking government jobs. The online applicatioan process for India Post, Haryana Circle Gramin Dak Sevaks has been started from 03 December 2018. Candidates may apply for the GDS posts though the application link given below. The last submitting date of application is 02 Jan 2019. 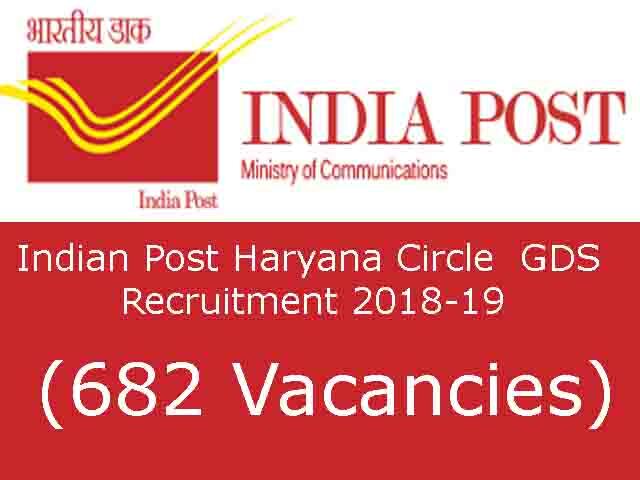 Candidate who applying for the India Post Haryana Circle GDS Recruitment 2019 should possess essential qualification. They should have 10th standard pas from any state Govt. / Central Govt. board. They must also have computer knowledge and will be required to furnish basic computer training certificate to apply for the posts. Selection procedure for the posts will be made as per the automatic generated merit list as per the rules based on the candidates online submitted applications. Last Date of Applications: 2nd January 2019. Educational Qualification: The candidates must have completed 10th standard from approved state boards by the respective State Govt. /Central Govt. No weightage will be given for possessing any qualification(s) higher than the mandatory educational qualification. The Candidate passed 10th class/secondary examination in first attempt will be treated as meritorious against those passed compartmentally. Computer Knowledge: The candidate should have computer knowledge and will be required to furnish basic computer training certificate for at least 60 days from a recognize Computer Training Institute. Certificates from State Government/ Central Government/ Recognize University/ Boards etc., will also be acceptable for this purpose. This requirements of basic computer knowledge certificate shall be relaxable in cases where a candidate has studied computer as a subject in Class X or Class XII or higher educational qualification provided the candidate submits a certificate a Class X or Class Xii or higher educational qualification in which he/she has studied computer as a subject. Age: The minimum and maximum age for the purpose of engagement to Gramin Dak Sevaks posts shall be between 18 to 40 years as on 03.12.2018. The maximum age shall be relaxable by three years to those belonging to OBC categories and five years in case of candidates belonging to SC/ST. Application Fee: Applicant of OC/OBC Male category should pay a fee of Rs. 100 for each set of five options. And all Male/Female belonging to SC/ST/PH category have the application fee completely free for them. Documents Requirement: SSC Marks Memo/ Certificate, Additional SSC Marks Memo1 for those candidates who have not qualified in single attempt, Additional SSC Marks Memo2 (for those candidates who are not qualified in single attempt and having more than two marks memo), Computer certificate, Community Certificate, Photo, Signature, Certificate of Disability. As per the rules based on the candidates online submitted applications the Selection will be made as per the automatic generated merit list. There is no weightage for higher educational qualification. Only marks obtained in 10th standard and approved by Boards aggregated to percentage to the accuracy of 4 decimals will be the criteria for finalizing the selection. As per the respective approved board norms passing of all the subjects are mandatory for taking candidate into account for calculating the merit. The selection will be based DOB, in case of same marks obtained by the candidates. Minimum TRCA for 4 Hours/level 1 in TRCA slab is Rs. 12000 (12000-29380) and Minimum TRCA for 5 Hours/level2 in TRCA slab is Rs. 14500 (14500-35480) for the category of Branch Post Manager (BPM). Minimum TRCA for 4 Hours/level 1 in TRCA slab is Rs. 10000 (1000-24470) and Minimum TRCA for 5 Hours/level2 in TRCA slab is Rs. 12000 (12000-29380) for the category of Gramin Dak Sevak. How to Apply for Indian Post GDS Recruitment 2019? Candidate who wants to apply online will have to register himself/herself in the portal through https://indiapost.gov.in or http://appost.in/gdsonline with the basic details to obtain the Registration Number. Once candidate has already registered in http://appost.in/gdsonline they need not register again. The same registration number must be used for submission of application. Any candidate who forgot the registration number may retrieve the registration number through option ‘Forgot registration’. Step 1: First visit the official website of Gramin Dak Sevak. Step 2: Then click on the link shown on the home page for the online application. Step 4: Next Fill up the correct details as per class X certificate. Step 5: save your details. Step 6: Click on the login button to submit your application,. Step 7: Next upload the scanned documents in the mentioned dimensions. Step 8: After that submit the application and take a print. Step 9: At last just pay the application fee online at the identified post office in the circle.